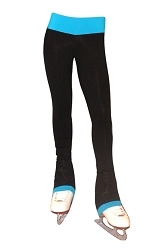 Supplex Turquoise ice skating jacket. Fitted style without the hood and 4 way stretch fabric provide muscle support and allowing freedom of movement. Available in child small, child medium and child large sizes.